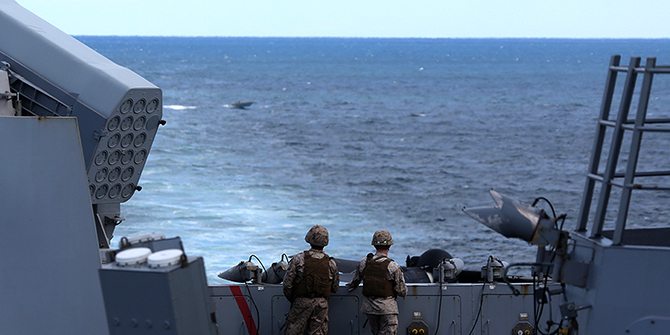 Marines watch as their ship passes through the Strait of Hormuz. © U.S. Fifth Fleet, 2014. Game theory was developed in the wake of World War 2 to assist policymakers in analysing interdependent decision-making, which arises when what you want to do depends upon what others want to do, most notably in situations relating to conflict over resources – the alternative is decision theory, where your decision is independent of others’ choices; for example, deciding whether you want to invest in the stock market or bonds for your retirement. Applying game theory to Iran’s recent threat to block the Strait of Hormuz reveals that Iran is highly unlikely to do so, as the move does not serve the Islamic Republic’s interests. A general game theory principle is that armed conflict is fundamentally irrational. The reason is that violence is costly to both sides, even the winner. This is particularly true of interstate wars, where even troop mobilisation is massively costly. Accordingly, if it is clear to both sides who will prevail in the event that combat ensues, it is preferable to reach a pre-combat settlement that averts the need for costly violence. A good example is an armed robbery: once the potential assailant threatens the victim with a gun, the victim will rationally surrender their valuables, and no shots will be fired. The robber saves ammunition, and avoids a potentially more serious criminal charge, while the victim avoids injury or worse. Uncertainty over who would prevail should combat ensue leads to a breakdown of this maxim, and the emergence of game-theoretically rational violence. For example, if the victim doubts the robber’s conviction, the robber may need to be more violent to signal his readiness to shoot if necessary. Similarly, the robber may suspect that the victim is concealing a weapon, and may therefore preemptively attack to ensure victory. Thus, game theory tells us that uncertainty is a critical ingredient for armed conflict. That explains why, in 2011, both Egypt and Tunisia’s leaders stood down with limited loss of life: in both cases, the incumbent had clearly lost the support of the military, and knew that they would lose an armed conflict. In contrast, in Libya and Syria, the incumbent was uncertain about the strength of their adversaries, and violence ensued. Turning our attention to Iran and the Strait of Hormuz, is there sufficient uncertainty to expect armed conflict? The US’ diminishing military activism in the Middle East has certainly made regional powers question the US’ commitment to deploying the Fifth Fleet to protect the Strait of Hormuz. For example, if Barrack Obama was willing to back down on the chemical weapons red line that he drew in Syria, perhaps he would do the same in Hormuz, especially in light of the US’ decreased dependence upon Middle Eastern oil. A further source of uncertainty is the increasing power of non-state actors in the region, such as the various terrorist militias operating in Iraq and Syria, and fomenting violence throughout the Arabian Peninsula. As governments direct their military resources to dealing with such groups, opportunities emerge for seizing control of previously stable territories and resources. Changing regional alliances have, however, altered the strategic consequences of armed conflict in the Strait of Hormuz. In particular, the two countries that would suffer most from an interruption of trade are Iraq and Iran, which are now allies, as compared to their pre-2003 state of mutual antipathy. Globalisation has also changed the balance of interests. China and India are both critical to the world economy, and highly dependent upon oil imports that pass through the Strait of Hormuz. As such, any disruption will draw the ire of the world’s two most populous nations, and all the advanced economies that thrive when the Chinese and Indian economies are performing well, including the US. As an indication of the importance of this channel, note that China and India historically do not deploy their militaries abroad, but made an exception as part of global anti-piracy efforts near Somalia, due to the economic importance of open waterways. The Iranian nuclear deal has also transformed Iran’s strategy from being an irritant to those imposing sanctions upon it, to attempting to convey an image of being a good partner. It now has a lot to lose if perceptions about its contributions to regional stability deteriorate, as sanctions can be re-imposed, and foreign capital that is on the verge of entering Iran will likely reconsider. In summary, prior to 2001, Iran would have potentially benefited from disrupting the Strait of Hormuz, but where there was no doubt that the US would prevail in any armed conflict, ensuring that none would arise in the first place. Today, there are doubts over the US’ resolve, but there is no question that Iran would be the biggest loser should the Strait be closed. Therefore, Iran’s threats are empty, which raises the question of their purpose. Talk is cheap, especially in the case of Iran, which has a particularly poor reputation in adhering to its word in interstate affairs. Yet, as military strategist Sun Tzu remarked, ‘the supreme art of war is to subdue the enemy without fighting’; if words can get the job done, why not? Omar Al-Ubaydli is the Program Director for International and Geo-Political Studies at the Bahrain Center for Strategic, International and Energy Studies, an affiliated associate professor of economics at George Mason University, and an affiliated senior research fellow at the Mercatus Center. He previously served as a member of the Commonwealth of Virginia’s Joint Advisory Board of Economists and as a Visiting Professor of Economics at the University of Chicago. He tweets at @omareconomics.